Snow covered pine trees, quaint villages decked out in lights, and the feeling of gliding down a mountain side, followed by hot cocoa by the fire. What could be a better way to spend a holiday? Vermont ski and snowboard resorts are a majestic destination during the holidays and offer many cheerful activities and packages to get the family there. Nothing brings friends and families together for good times quite like the holidays, and holidays spent on snow create lasting memories. Bolton Valley’s cozy base village will be trimmed in white lights for the holidays, creating a festive atmosphere for guests at the resort. In the week between Christmas and New Year’s Day, the mountain will be full of guests enjoying skiing, riding and daily family events. The Indoor Amusement Center will be open every day this week. Free, family oriented evens include a Magic Show and a Balloon Twister creating balloon sculptures. Skiers and riders will also have a chance to warm up around a campfire with complimentary hot cocoa and cookies or head inside for family movie night. The best holiday’s are spent at Bolton Valley, your neighborhood ski area. Join Bromley for some classic Christmas holiday fun to kick off the vacation week. Dress up like Santa on 12/25/14 and ski or ride for just $25. Yup, that’s right… break out the red, white and jelly belly and be on the hill for cheap. Wear a santa outfit to the ticket office to redeem savings. Coat, pants, hat and beard (real or fake) are a must. Food comas are something to be thankful for. Try Thanksgiving at Howie’s or Alice’s for a hearty homemade meal slopeside. Work off the buffet on opening day when Stateside gets the lifts rolling on November 28th. Ring in the New Year at Jay Peak with fireworks and music. Details soon at jaypeakresort.com. Thanksgiving at Killington means shredding the slopes, and the first rail jams of the season in Loaded Turkey and Rails 2 Riches. Another tradition, the Killington Test Fest, goes down at the base of Superstar on Tuesday, December 16 and Wednesday, December 17, showcasing the best gear for the 2015 season. And be sure to hit the after party at the Wobbly Barn on Tuesday night. Lift ticket deals up to 60% off are available at Killington.com, where you get Beast Tickets, Best Price. Pico Mountain opens on December 13, 2014, and a full season of Family Mountain Fun awaits. The holidays are a special time at Mount Snow starting Thanksgiving weekend. Friday, November 28 is the Turkey Hangover Hill Climb and then on the 29th the resort will have its first Torchlight Parade (conditions permitting) and Fireworks Extravaganza with a visit from Santa and Mrs. Claus. Book two nights and get the third night free over Thanksgiving weekend. The Christmas holiday week is loaded with events and activities including Grommet Jam #1 for kids age 12 and under on Monday, December 29. New for this year, enjoy a huge family-friendly Torchlight Parade and Fireworks display on New Years Eve plus live music all week long, family activities and more. Okemo kicks off the holidays with a traditional Thanksgiving Day dinner at Coleman Brook Tavern, followed by the annual Trot it Off 5k, November 29. The holiday season is sugarplum-packed with fun events and activities like visits with Santa, a food drive, a Demo Day, a torchlight parade with fireworks, a moonlight hike, an ice skating party, the Mountain Dew Vertical Challenge and more. Finally, Okemo rings in the New Year with its annual Family New Year’s Eve – an evening of fun that culminates with a DJ dance party and fireworks show. And of course, there’s lots of great skiing and snowboarding at Okemo. 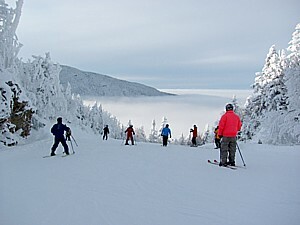 Call (802) 228-1600, or visit okemo.com. Gobble up a Thanksgiving weekend getaway at Smugglers’ Notch Resort with a three night stay in condominium lodging starting at $372 in a studio home. On Thanksgiving Day, the resort’s Hearth & Candle will serve dinner. Ski or ride on intermediate terrain beginning Friday, November 28 at early season lift ticket pricing ($50/adult, $38/youth ages 6-18). Other holiday weekend activities include enjoying a zip line canopy tour and family fun such as a minigolf tourney in the indoor FunZone, nature walk, or bingo. Take everything you don’t like about holiday lift ticket lines and make that easy, as easy as walking from your car directly to the lift and going skiing. That’s the ByPass at Stowe Mountain Resort. Simply get an Evolution Stowe Card online, sign-up for ByPass and go direct to the lift every day you ski or ride in Stowe. Add to that, instantaneous savings by automatically paying the discounted ByPass rate, even during the holidays, the first time you’re scanned at the lift each day. The Evolution Stowe Card has replaced traditional tickets, using RFID technology for optimum convenience and value throughout Stowe Mountain Resort. The holidays are a tradition at Stratton Mountain where Thanksgiving starts with the Gobble Gobble Wobble 5K. That’s one way to earn your dinner, served up at restaurants throughout the Village including Table 43.1 where the feast is Vermont farm-to-table. Skiing, riding and plenty of family activities round out the opening weekend celebration. There’s no place like the mountains to ring in the New Year. This year, those new gondola cabins will provide a perfect vantage point for viewing the torchlight parade and fireworks. Movies and music. Sugar on Snow. Snowshoe treks. Snowmobile tours. Snowtubing. Ice Castle. Dogsledding… It’s all on the holiday week menu at Stratton Mountain. Sugarbush hosts numerous fun activities for the whole family starting in November through the holidays. Don’t miss The Big Kicker, the winter kickoff party complete with films, freestyle expos, food, presentations, and more. The annual Taste of Timbers event takes place on December 8th where you can sample locally inspired foods prepared by our culinary team. Christmas week, enjoy everything from the kids’ cooking class and cookie decorating to a live bird show and family fun nights with street performers. Be sure to enjoy the Torchlight Parade and Fireworks Display on New Years Eve, as well as a dog parade earlier in the day.